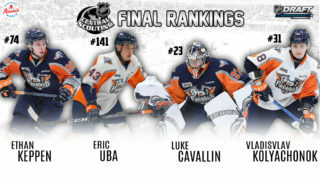 Flint, Mich. – The Flint Firebirds added three new prospects to the organization in the third annual Under-18 OHL Priority Selection, Wednesday, Apr. 10. The Firebirds selected one goaltender, James Gray, one defenseman, Spencer Lecot and one forward, Ryan O’Donnell. 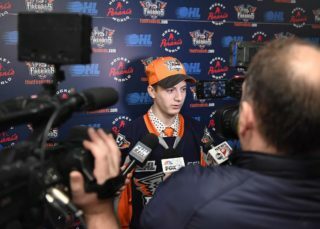 Wednesday night’s draft followed Saturday’s Under-16 OHL Priority Selection where the Firebirds added 15 new prospects to the organization. 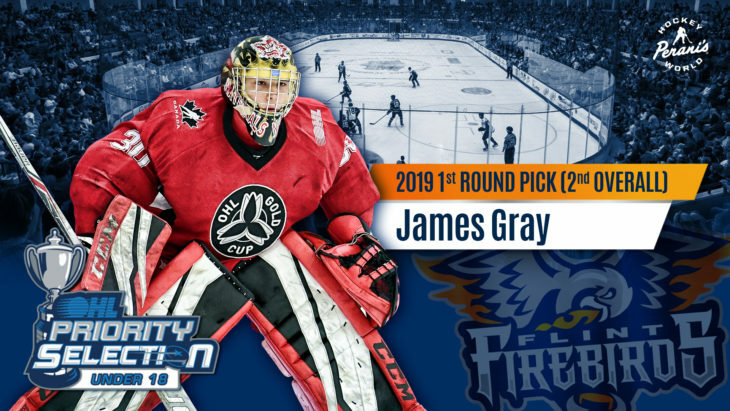 The Firebirds selected goaltender James Gray with the second-overall pick. Gray, has posted an impressive 37-6-7 record through 50 games including a 1.26 goals against average (GAA) and a .950 save percentage (SAV%) en-route to leading the Toronto Nationals Midget Major AAA Hockey Team to a Greater Toronto Hockey League (GTHL) championship. The Toronto, Ont. native also recorded a 2.77 GAA and a .889 SAV% in three games with Team GTHL Red at the prestigious OHL Cup last season. Gray, a 6-foot-1, 171-pound netminder, played in all six games leading the Toronto Nationals to win the Big Nickel Major AAA International Hockey Tournament championship in Sudbury this past November. Additionally, Gray posted a shutout, recording 24 saves, in the Ontario Hockey Federation’s (OHF) Central Regional Championships to lead his team to the The TELUS Cup, Canada’s National Midget Championship, which is televised nationally on TSN Apr. 22-26 in Thunder Bay, Ont. Next, the Firebirds selected right-defenseman Spencer Lecot with the 22nd-overall pick. 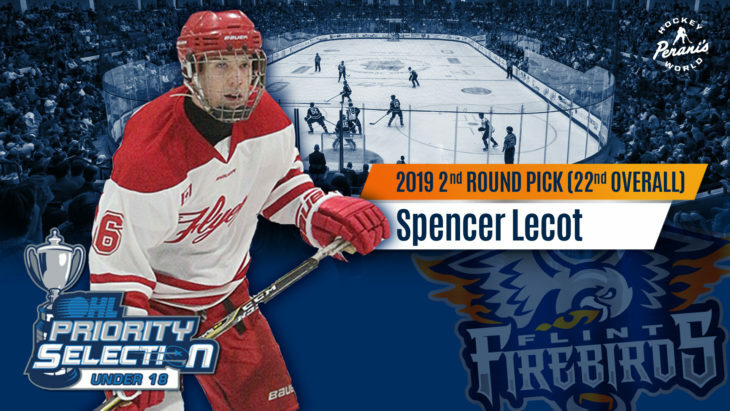 Lecot averaged nearly a point-per-game as a blue-liner this past season, recording 33 points (17G, 16A) in 35 games with the Windsor Jr. Spitfires in the Hockey Alliance of Ontario (MHAO). The 5-foot-11-and-three-quarters tall, 165-pound defenseman also recorded three points (1G, 2A) in six ‘Junior B’ games with the Leamington Flyers in the Greater Ontario Junior Hockey League (GOJHL). Lecot was selected to represent Team ALLIANCE at the 2018 OHL Gold Cup, was named captain of the Chatham-Kent Cyclones Midget Minor AAA Hockey Team last season and won the MHAO Championship during his Pee-Wee Minor year. 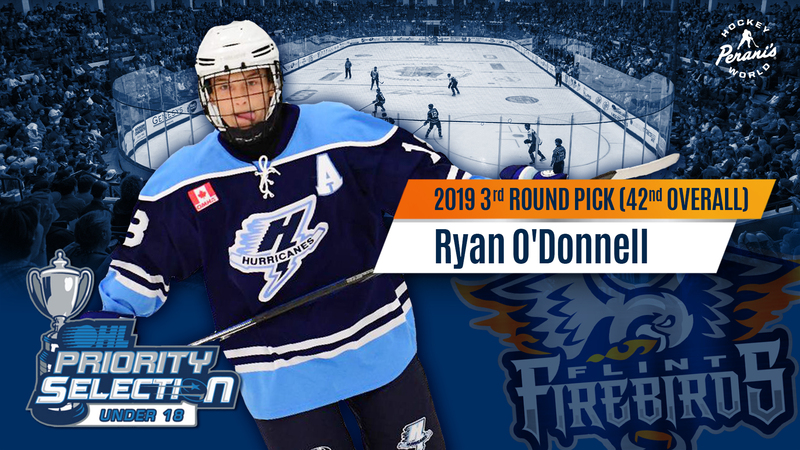 Flint then selected Ryan O’Donnell with the 42nd-overall pick. O’Donnell was selected to the GTHL’s Midget Major All-Star Team this year after being second on the Toronto Titan’s roster with 18 points (8G, 10A) last season. The 5-foot-10-and-one-quarter tall and 152-pound forward was also named to the Ontario Minor Hockey Association’s (OMHA) Bantam Major All-Star Selection as a member of the Halton Hurricanes. Fans can meet the newest additions at the Firebirds’ annual orientation camp May 17-19 at Iceland Arenas on Elms Rd. in Clayton Township. Firebirds’ newly drafted prospects from the 2019 OHL Priority Selection, prospects from previous OHL Priority Selections, as well as free agent invites and current Firebirds will be in attendance. Fans are invited to attend the annual Firebirds’ Blue vs. White scrimmage Saturday, May 18 at Flint Iceland Arenas. This event is free and open to the public.